I don’t know how people today can function without a daily helping of silence and/or stillness. It is a window to sanity, peace and balance, away from the complexity, demands, hustle and bustle of urban life. In silence, we tap into and become aligned with the energy of the cosmos. In stillness we are able to do deep mental work that enlivens our souls. When I see people plugged into the relentless blaring of i-tunes or whatever, I wonder how they are able to function. I wonder where modern society is heading. So I think it is important that everyone gets perspective and finds the time to slow down, stop doing and focus on just being. My ritualistic time in silence is an eclectic jigsaw puzzle. It incorporates snippets from my Masters work in Religious Studies and Ritual Studies, plus an array of scientific and not-so-scientific books. It also includes personal convictions about the centrality of the Heart Chakra. The resulting meditation is the harvest of much study and reflection. It all comes together in my personal formula. In sharing the details, I hope that you might find some part that inspires you (if you do not already) to begin regular meditation. Key conceptual ingredients of my recipe include energy, chakras and visualization. By ‘energy’ I am referring to the life force (also called Chi and Prana) that animates living beings. We are electromagnetic, vibrational beings. You may experience this ‘aliveness’ as you contemplate the tingling sensation when you hold your concentration on the tips of your fingers. Chakras, from the Buddhist and Hindu traditions, are said to be whirls of energy (often depicted as wheels or flowers). They are visualized as rotating vortices that constitute subtle energy connections between the physical world and beyond. Each connection (seven of which are located along the spinal column) also correlates with a basic state of consciousness and specific bodily functions. Visualization is a technique that uses the imagination to condition a person’s reality, both in the present and in the future. Historically the practice stems from the Hindu Monistic theory of the Universe. Currently, it is used by athletes and in various medical methodologies. In my meditation, I begin by “running my energy” in a seated position. This is a feeling as much as it is a process. I divide the chakras into two groups, one for the bottom half of our bodies and the other the top. I check in with each chakra in a certain order while visualizing specific colours and corresponding associations, e.g. green and expanding love. Starting with the lower half, I wait until I feel the connection to the Earth’s energy flowing into me; what I understand to be the negatively charged (associated with the Feminine Principle) source of my Earthly existence. It’s like a very subtle charge that builds up and travels through the bottom of my feet. The feet are the first chakras that I honour. I imagine black obsidian there, rooting me in beloved Gaia. The energy seems to shoot up my legs to my Root Chakra at the base of my spine. This chakra is vibrant red and corresponds with our most basic self. To me, it’s like a grounded base that reflects our basic “fight or flight” response. So meditating on it gives me a sense of balance and a strong core. At this point the energy starts to swirl in a clockwise spiral, up the spine, to the second chakra. Located two inches below the navel, it is called the Sacral Chakra and is a happy orange. It symbolizes relationships, sexuality and basic emotional needs. Personally, I meditate on my group processes and how connected I am to others. The spiral then takes me upward to the Plexus Chakra, in the solar plexus. This honey yellow vortex houses the will. I visualize personal power and matters of manifesting on the physical plain. Finally I reach my Heart Chakra, at the centre of my physical body and spiritual being. I visualize it as an alive, kelly green. I believe it to be the centre of consciousness and our connection to each other and the world. I believe it is also our link to the Divine. I picture expanding love, forgiveness and harmony here. These five energy hubs form the bottom half of a donut, i.e. 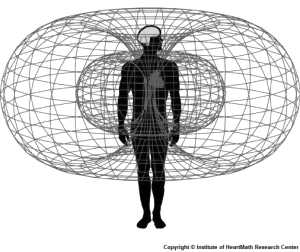 “heart torus” shape (shape of self perpetuating energy models). I suspend the energy flow at the heart as I jump to the Crown Chakra, located above the top of the head. It is considered to be the chakra of pure consciousness. I envision a glistening white cone funneling divine energy into the top of my head. The positive magnetic pole (Masculine Principle) links me with a universal consciousness that exists beyond form. Both the top of my head and the bottoms of my feet are connections to a type of greatness that seems to feed me the fathomless stuff of Source. I imagine the energy spiral then swirling down to the Brow Chakra. Its indigo colour feels deep and penetrating. I feel a distinct buzz in my “third eye” whenever I focus here. I look to the Brow Chakra for intuitive wisdom and understanding. The spiral continues to the Throat Chakra. The pale sky blue wheel stands for communication and growth through expression. Here, I focus on being impeccable in what I express in thought, word and deed. (This also constitutes one of the ‘Four Agreements’ by Don Miguel Ruiz). The spiraling energy continues across my shoulders and down my arms to the centre of my palms. I envision the rich brown colour of earth. It feels warm and healthy as it governs healing. I massage and nourish my healing ability as I deepen my awareness and appreciation for my hands. Finally, the spiral doubles back up my arms and down to my Heart Chakra again, where both halves of my body are energetically joined. The Heart Chakra is the hinge as well as the door to everything beyond myself. It is the crown of the lower half and the platform for the upper half. In this portal, primordial forces (from above and below) are fused as they stream from my chest in a silky flow of completion and unity. 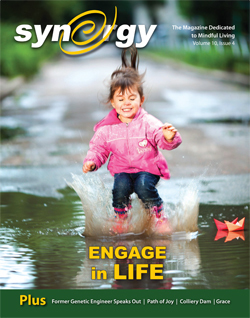 I feel a cohesive synergy throughout my body at the same time that I feel plugged in to the universe. I sit for a moment, savoring the vision of the heart torus that extends beyond my self; above, below and all around me. Running my energy conditions the space for the remainder of my meditation. I am then able to sit in a calm, quiet manner as I reach for a stillness in mind, body and spirit. To help keep the ‘monkey mind’ at bay, I think ‘rising’ as I inhale and ‘falling’ as I exhale. (This is a Buddhist technique.) As thoughts come to me, I gently let them go and return to just breathing. An enveloping sense of peace and harmony infuses my being as I meditate. I have come to joyfully anticipate the familiar, loving energy that cradles me here; and each time I return, I am home. Afterward, I press my palms together, in front of my heart, in a praying posture. (There is something about this pose that seems to be quite primal.) I give thanks for many things (also primal), including loved ones. They include my family, friends, angels/spirits and animal totems. Everyone is silently named (somehow I think naming is important too) as I send them light, love, peace, joy, health, wellbeing, harmony, strength and clarity. The list keeps growing as I make my way through life. In the end, the details are meaningful to me so they work. You may want to shape your meditation with your immediate surroundings, thereby taking it up a notch. Make it powerful by placing other spiritual aspects (meaningful to you) in your meditation area, such as Goddess images, trees, candles, burning sweetgrass or incense, a lit fireplace, a cross, a star, flowers, water or even a photo of yourself as a child. It is more about intention than anything else. The whole process may take only about fifteen minutes yet I can easily lapse into a thirty minute ‘time out and recharge’ session without noticing. This quiet reflection sets me up for clarity and balance throughout the day. So I make meditation a mainstay of my daily routine. This entry was posted on Sunday, May 27th, 2012 at 10:02 am	and is filed under SPIRIT. You can follow any responses to this entry through the RSS 2.0 feed. You can leave a response, or trackback from your own site.